WASHINGTON, DC — Today, the DC Council gave preliminary approval to a landmark climate policy called the “Clean Energy DC Omnibus Act of 2018,” known as the “Clean Energy DC Act.” The Council voted unanimously in favor of the bill, which would strengthen the District’s renewable electricity requirement to 100 percent by 2032, raise money to weatherize low-income homes, and more. Councilmember Robert White (At-Large) did not vote because he was not present, but he is a co-sponsor of the bill. The vote took place in the wake of an alarming new federal report showing climate change is already affecting Americans nationwide, including residents of DC. The Fourth National Climate Assessment, released by the Trump Administration the day after Thanksgiving in an apparent effort to reduce news coverage, paints an alarming picture of current and future economic and humanitarian harm to Americans unless the US and nations worldwide transition off of fossil fuels very quickly. The “Clean Energy DC Act” would put DC on the fastest timeline to 100 percent clean electricity in the country — California recently passed a bill for 100 percent carbon-free electricity by 2045. It would cut DC’s total emissions almost in half by 2032. The DC Council is expected to vote on this bill for the second time on December 18, after which it will be sent to Mayor Muriel Bowser for her signature. 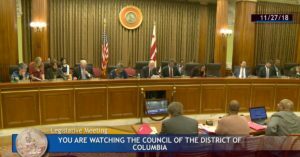 Today the Council also refrained from voting down a concerning amendment that could undermine the energy efficiency portion of the bill and could have a negative impact on DC ratepayers. The amendment, which was added in by Councilmember Kenyan McDuffie (Ward 5) at the suggestion of Exelon-Pepco days before the vote, would give Pepco authority over how efficiency investments are made, undercutting the longstanding decisions DC has made to support independent-run efficiency programs instead. In the Committee of Environment and Transportation meeting on the bill, Councilmember Charles Allen (Ward 6) explained how it could allow Pepco to “double dip” — to charge ratepayers twice for the same energy efficiency investments. Councilmember McDuffie passed out a revised version of the amendments before today’s vote just minutes before they were accepted. According to Councilmember Allen, the revised amendments addressed some of the concerns but he expects to further address the amendments before the second reading instead. “D.C.’s clean energy bill is a win for working people, who are the most vulnerable to climate change. The clean energy bill will go a long way towards ensuring that clean air and water are a right for everyone, not a privilege enjoyed only by the wealthy,” said Jaime Contreras, 32BJ SEIU Vice President. In addition to dramatically expanding the Renewable Portfolio Standard, the “Clean Energy DC Act” also takes aim at emissions from home heating and transportation. It would scale up an existing heating bill surcharge called the Sustainable Energy Trust Fund (SETF), which would raise tens of millions of dollars to finance renewable energy projects and provide assistance to low-income DC residents. The bill would create efficiency standards for new and existing buildings and would fund local programs to assist low-income residents as the District transitions to more sustainable clean energy systems. It would also adjust the vehicle excise tax to incentivize clean cars and make owning dirty vehicles more expensive. The legislation also authorizes the District to put a price on transportation fuels if Virginia and Maryland commit to the same. 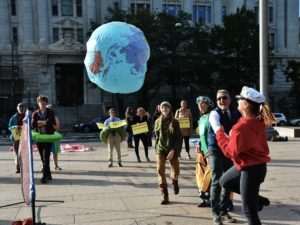 The “DC Climate Coalition” is comprised of more than 110 environmental and justice advocacy organizations, faith groups, unions, consumer advocacy organizations, DC businesses, and more. WASHINGTON, DC ⎼ According to 10,630 DC residents, it’s time to pass the Clean Energy DC Act. Many of them turned out yesterday, along with the Chesapeake Climate Action Network (CCAN), to decorate the halls of the Council with signed petitions as well as hand deliver them to council members. 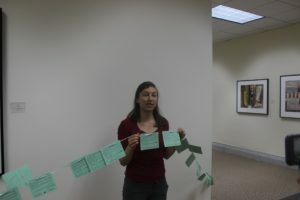 CCAN kicked the day off by stringing more than 10,000 signed petitions together in a blue and green banner. Residents then, stood side by side with it to span the width of the first floor of the Council building. Together, they “drew the line” for climate action. The inspirational event ended with DC residents going office by office with a simple message “The climate can’t wait, and neither can we.” Years of progress calls for a strong and equitable climate and clean energy policy right here in DC. If you are a DC resident, you can lend your voice to the cause. “Send a message to your council members”, said Camila Thorndike, DC Campaign Director at the CCAN Action Fund. Passing the Clean Energy Omnibus Amendment Act of 2018 puts DC economically and financially forward. Click HERE to send a message to your Councilmembers asking them to pass it today! Click HERE to relive the excitement of the day and see a video of the historical petition drop! WASHINGTON, DC ⎼ On Monday, October 29, in a park across the street from the John A. Wilson building, supporters of the Clean Energy DC Act and CCAN played a game of beach volleyball. The game aimed to promote “endless summer” temperatures if the bill to climate change isn’t addressed by the DC Council. The final vote is scheduled for December 1. The Wilson building was the site of the final public hearing on the Clean Energy DC Act with councilmember Kenyan McDuffie. Before the final hearing, dozens of climate advocates testified to urge DC Council to act on the climate change and protect their communities and generations to come. Sergio Martinez, a Catholic University graduate, testified on the importance of passing the Clean Energy DC Act as a way to care for neighbors and communities. “As policy-makers, you have the opportunity to act on climate, protecting our neighbors in DC,” he stated. The climate is rapidly changing and, according to recent reports, world leaders have less than 15 years to take extreme action and prevent damage to the earth. Passing the Clean Energy DC Act bill is the answer to the IPCC. Initial photos available via Twitter hereand Facebook Live video available here. The event preceded a hearing in the Committee of Business and Economic Development, where more than 80 advocates have signed up to testify in support of the bill (out of 109 total). 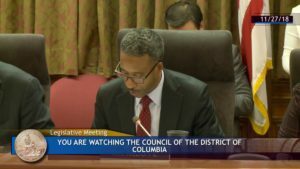 Councilmember Kenyan McDuffie (Ward 5) chairs that committee, and activists are looking to him to bring the bill out of his committee to a full floor vote. “By passing this bill, DC will become nation’s undisputed leader in battle against climate change, taking the first of many significant steps in paving a sustainable future for humanity for generations to come,” said Nikhil Balakumar, founder of the Greentel Group. The climate crisis has reached a new level of urgency since the United Nations’ Intergovernmental Panel on Climate Change (IPCC) released a report finding that the world has 12 years to take drastic action and prevent catastrophe. The report calls for global carbon emissions to be cut in half by 2030 and for fossil fuels to be almost entirely phased out by 2050. 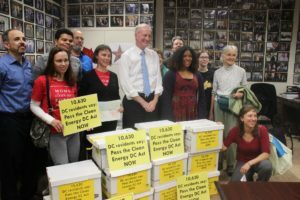 The “Clean Energy DC Omnibus Act of 2018,” or “Clean Energy DC Act,” is seen as the District’s answer to the IPCC. It takes a comprehensive approach to reducing carbon emissions, cutting greenhouse gas emissions by 49.4 percent by 2032 according to an initial analysis from the Department of Energy and Environment. “We hope that passing strong climate legislation in the nation’s capital that meets the goals of the IPCC report will set an example of smart energy policy that works and inspire Congress to act,” said Stephanie Doyle, National Outreach and Partnership Coordinator at Citizens Climate Lobby. The bill is formally supported by eight of the 13 members of the DC Council, with Councilmembers Mary Cheh (Ward 3), Charles Allen (Ward 6), Trayon White (Ward 8), Brianne Nadeau (Ward 1), and Chairman Phil Mendelson co-introducing the bill, and Councilmembers Vincent Gray (Ward 7), Robert White Jr. (At-Large), and David Grosso (At-Large) co-sponsoring it. Councilmember Brandon Todd (Ward 4) has tweeted his support for it as well. This bill had its first hearing on October 9 in the Committee of Transportation and the Environment on October 9, which is chaired by Councilmember Mary Cheh (Ward 3), who introduced the bill. About 90 people signed up to testify, and nearly all of them testified in strong support. That hearing was covered in the Washington Post, NPR, and many other outlets. It also would create groundbreaking efficiency standards for new and existing buildings and would fund local programs to assist low-income residents as the city transitions to more sustainable clean energy systems. This bill is supported by the “DC Climate Coalition,” which is comprised of more than 110 environmental and justice advocacy organizations, faith groups, unions, consumer advocacy organizations, D.C. businesses, and more. Faces of the Campaign is an ongoing series featuring our key organizers and stakeholders involved in “Put A Price On It, D.C.” Our coalition of 80+ organizations is comprised of racial justice activists, union workers, health advocates, moms, dads, kids, retirees, and business-owners alike. Peter Braun is a summer communications intern working on the campaign. Here’s his story. 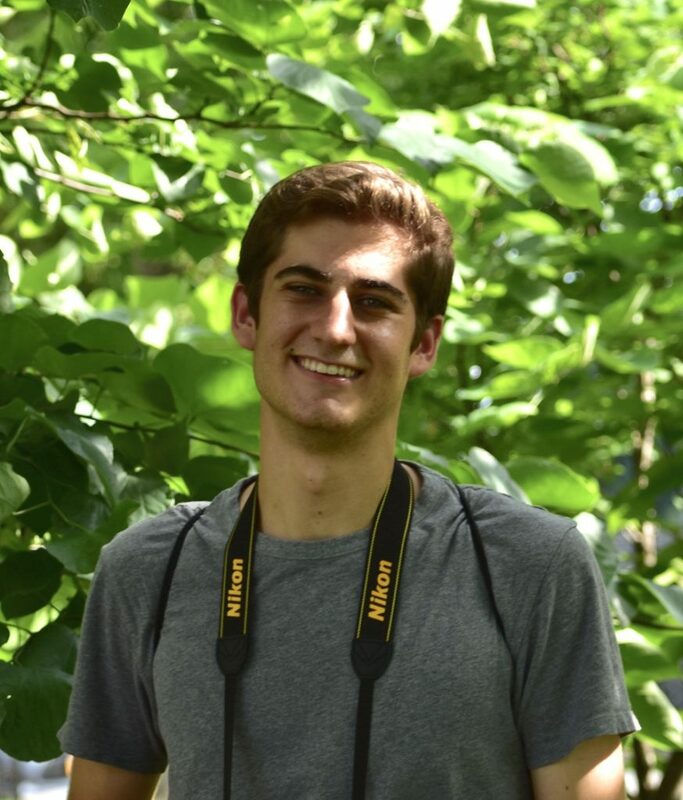 My name is Peter Braun and I am a Communications Intern DC CCAN office. I’m the guy writing the clever tweets and Facebook posts for @PutAPriceOnItDC. I’m also a student at University of Richmond and an intern at the City of Richmond, Office of Sustainability. What woke you up to the climate crisis? I have always loved the natural sciences. At some point in middle school, I looked around and realized that no one else seemed to care about what was happening to the Earth as much as I did. It wasn’t until the summer before my first year in college that I realized no one was going to take responsibility for the environment, so I had to step up. 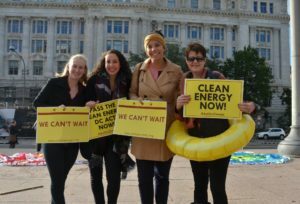 Why does supporting equitable clean energy policy in DC matter to you? Energy giants need to start taking responsibility for what they are doing to our world. So many average people like my family want to do their part to fight climate change, but they just do not have the resources to do it. This policy will start in DC, but I hope it inspires other cities to enact radical clean energy policies. I am fighting for DC because I want DC to set an example for my home town and spread this movement. How is this campaign different from other environmental campaigns you’ve experienced in the past? I have never seen so much action, engagement, and thoughtfulness on an environmental campaign before. There is an outpouring of support to the people we talk to when we go out to petition. There is so much enthusiasm and hope. The leaders of this campaign have worked with community organizations and made sure all DC residents are represented. How has climate change impacted your own community? Growing up just outside DC, and now living just outside of Richmond, you see just how vulnerable the homeless and poor are to the environment. Seeing reports of heat waves causing health problems in my own community is shocking. Knowing that my family could be so vulnerable makes me want to find a way to protect our common home, both the environment and my community. What was your favorite moment in this campaign? It’s simple, but every Monday our team of about 10 interns and our supervisor Chelsea begin the week with a meeting. We start out with news about the campaign and fun, random facts. It’s about coordinating for the week as a team, but it really builds a great community. Tell me about a time you’ve witnessed community power. What was your biggest accomplishment on this campaign? The first time I went out petitioning, I happened to run into a local, high-profile faith leader. He was our first signature! It was just the best start to the campaign I could have gotten. I even got to help set up and attend a meeting to discuss our campaign! Best place to get breakfast in DC? I’ve been spent a lot of money at Takoma Beverage Company. I always get a latte and a honey-pistachio pastry. A bill is coming? Here’s our take. During a press conference on June 5, we discussed the differences between Councilmember Mary Cheh’s draft proposal for a carbon pricing bill and our own proposal. To clear up any confusion, here’s some context on what’s happening with the two differing proposals. After you read, send a message to Council Chairman Phil Mendelson urging him to introduce the carbon pricing bill as soon as possible. We appreciate Councilmember Cheh’s leadership towards strong climate policy. Since October, her office has convened a “working group” to fulfill the Chairman’s request for a consensus approach. In May, Councilmember Mary Cheh’s office released a discussion proposal that aims to find a compromise between the aims of advocates and business representatives. We are excited to see that the proposal prices heating fuels, takes an innovative approach to transportation, and strengthens the Renewable Portfolio Standard, or RPS. It directs revenue to residential rebates, the Green Bank, and energy efficiency. Councilmember Cheh’s proposal is headed in the right direction. Before passage, however, we believe that it must be strengthened. In order to meet Mayor Bowser’s commitment to the Paris Climate Agreement’s emissions reduction targets and to carbon neutrality by 2050, we need a much more robust price on carbon. The Coalition remains committed to a policy that starts at $20 per ton in 2019 and rises $10 per year to reach $150 per ton in 2032. If that sounds high, consider that even conservative national proposals begin at $40/ton, and experts recommend that prices reach the hundreds – if not thousands of dollars – within a few decades. Councilmember Cheh’s proposal cuts this price path ambition in half. It begins pricing only heating fuels at $10/ton, increases only $5/year, and caps at only $100 in 2038. As a result, the Coalition proposal cuts 2.2 times more carbon from oil and natural gas use. It would cut climate pollution in DC by at least 23% by 2032. The alternative will reduce less. There is also a reduction in scope of the carbon price itself. 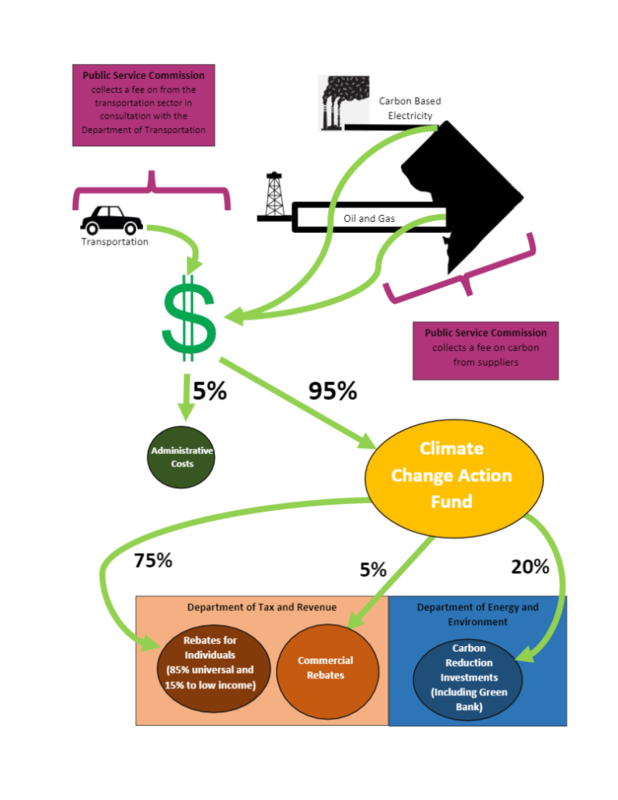 Cheh’s proposal excludes electricity from the price, which by 2013 accounting comprises about 55% of District emissions. Instead, her proposal relies on Chairman Mendelson’s 100% by 2050 RPS bill introduced last month. The best research on what is necessary to avoid the worst impacts of climate disruption, for instance the Beyond 2 Degree Scenario from the International Energy Agency, shows that the United States and other developed countries need to move to 100% clean energy across the entire economy (not just electricity) by 2050. This necessitates a move to 100% clean electricity even sooner so that renewable electricity is able to power transportation and heating needs by 2050. If the Council is intent on reducing electricity emissions via a new RPS, the target date must be significantly sooner. That said, we applaud innovative elements of Councilmember Cheh’s proposal that would lead to additional clean energy development in the region, and push Pepco-Exelon to green its energy mix faster. We also applaud her approach to transportation, which mirrors our own. The final bill should specify that DC will price gasoline and diesel once one neighboring jurisdiction does the same. Our Coalition continues to believe that rebating 75% of the money to District residents is the best use of the funds. However, we are open to Cheh’s proposal of appointing a temporary commission to address how to fairly send revenues back to low and middle-income households. 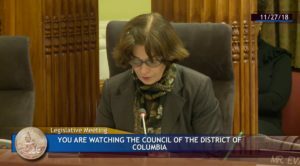 We again wish to thank Councilmember Cheh for her sincere efforts on pricing carbon in the District. It has been a remarkable investment of time and care that reflects how seriously she takes the issue of climate disruption. We look forward to working with the Council to introduce a strengthened bill before the summer recess and passing it this year. Faces of the Campaign is an ongoing series featuring our key organizers and stakeholders involved in “Put A Price On It, D.C.” Our coalition of 70 organizations is comprised of racial justice activists, union workers, health advocates, moms, dads, kids, retirees, and business-owners alike. 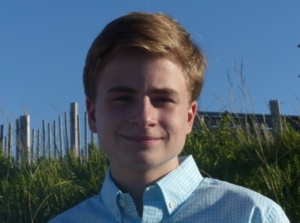 Michael Riley Price is a student fellow working on the campaign. Here’s his story. My name is Michael Riley Place and I am a graduating senior at St. John’s High School in DC. I am an Our Climate Fellow working on the campaign as part of the steering committee. When I was 13, my family moved to New Zealand. Although I have been passionate about the environment my entire life and had learned about climate change, the implications a changing climate has on our Earth never really struck me until I was standing in a ravine carved out by the Fox Glacier. While the glacier still exists, century old images showed it to be significantly larger, stretching through the entire ravine. I realized then, that in only one hundred years, a relative blink of an eye, human society changed the world so much. Besides the melting of glaciers, there has been intense melting of the ice caps, bleaching of coral reefs, and desertification of rain forests, all because of climate change. The government of New Zealand has always been a leader on environmental issues, recently ratifying the Paris climate agreement and banning offshore drilling. I have come to realize that while the United States has endangered ecosystems just like New Zealand, it has not taken the same action to ensure these places are preserved. Why does the campaign to put a price on carbon in DC and rebate the revenue matter to you? The tricky thing about climate change is that no matter where someone lives, their carbon footprint affects the entire world community. As climate change is the product of billions of people emitting carbon in their daily lives, a few individual decisions to bike to work or switch light bulbs is not going to make a significant difference. Entire communities must come together to move towards sustainability, by ensuring that people pay for their pollution. I believe that putting a price on carbon would not only discourage carbon pollution in the district and allow Washingtonians to reduce climate change as a united community, but by being passed in the nation’s capital it would set a national precedent for more cities to follow. Also, the rebate would ensure that communities unable to pay for the increased heating and transportation costs are not stifled by them financially. This is the first campaign, environmental or otherwise, that I have played a role in. I love the positive energy of the people involved with the campaign. Although everyone has been working for a long time to ensure that climate change is addressed, and lately it seems our government is taking a step back in environmental progress, everyone still has hope. Hope that if we keep working towards a sustainable future, we will get there. The steering committee is also made up of a very diverse group, with members hailing from government, businesses, faith-organizations, nonprofits, or grassroots backgrounds. I have learned a lot about the different perspectives that go into forming a successful campaign. The effects of climate change are so numerous and far-reaching that it plagues various communities differently. The United States has been experiencing increasingly hotter temperatures and irregular weather patterns. While many of us have the power to manipulate temperatures using air conditioning, there are many Americans who cannot afford this luxury, and billions around the globe who do not have access to it, these people are forced to deal with these rising temperatures. Irregular weather patterns are not only an inconvenience, those who lie in the path of storms face complete devastation. Additionally, many species are adapted to certain climate patterns, causing them to experience the changes intensely. My favorite moment was participating in the lobby day in March. This was my first experience lobbying and I found it extraordinary to see elected officials speak directly with their constituents about the changes they want to see in their community. Council members Robert White and Stephen Grosso showed their support for the policy and this was really cool. I witness community power every meeting of the steering community. The diversity of groups represented in the committee is amazing. Student groups, clean power businesses, environmental networking groups, a youth run political action committee, faith organizations, grassroots community groups, and even the Citizens Climate Lobby come together to plan the next steps. This ensures the policy is addressed from all angles. Furthermore, volunteers from the campaign have promoted the policy everywhere from ANC meetings to church events, bringing news of the policy directly to the community. This collaboration was apparent during the youth lobby day, where many people turned out for meetings with representatives and a rally in front of the Wilson Building. It was extraordinary to see so many different people united around one vision. There have been so many great moments of this campaign, and with the introduction of the bill just around the corner, I know the best moments are yet to come. One of my biggest personal accomplishments of the campaign was writing a speech about why “the bill is late” and delivering the speech at the rally preceding the youth lobby day. As a high school student, it is my generation that will witness the worst parts of climate change, yet we lack the vote and attention of policy makers, I feel as if this is lost on our government. It was extraordinary to give my perspective and then meet with the policy makers directly, giving me hope that in time our leaders will come to realize the importance of protecting the environment for the sake of future generations. If you could tame a wild animal to do your bidding, what would it be? A Parrot. This parrot would be fluent in several languages and help me to translate, it would spy on people, deliver food to my house, and be able to have deep and philosophical conversations. It’s finally here–the date Councilmember Cheh has proposed to introduce a carbon fee bill! Join us for a press conference and to celebrate. We have a (draft) bill. *NOTE: This is a draft bill from the Put a Price On It DC coalition – the final bill released by the DC Council may differ as it is revised and edited. Big, exciting news from the #PriceItDC coalition! 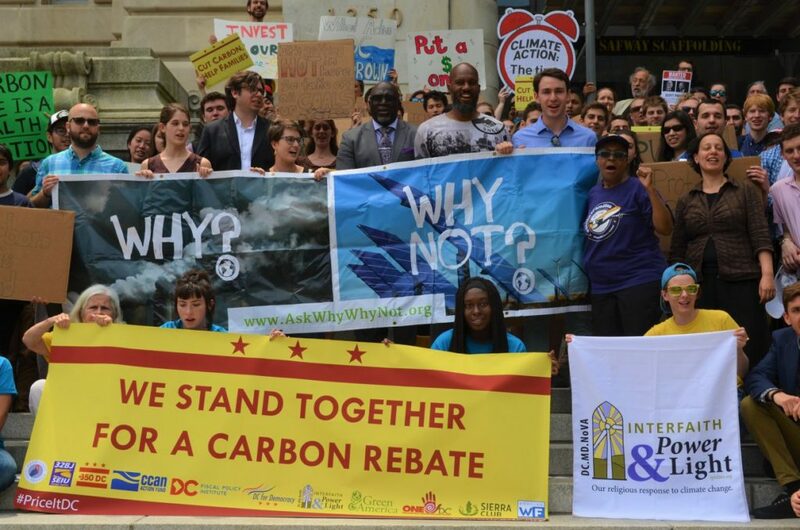 After years of organizing and deliberating, the coalition has put together a draft of a bill that would place a fee on carbon pollution and rebate the revenue to DC residents. MANY thanks to the several policy experts, researchers, coalition partners and legislative drafting volunteers who have worked relentlessly to bring the coalition’s vision into reality. See the bill in full below — click through to see it all! Election season is underway for the D.C. city council. Join us during the month of May at candidate forums to show your support for #PriceItDC and climate action. We need YOU to make sure that everyone running for office this year knows: D.C. residents want leaders who will act on climate, protect our communities, and pass a carbon rebate NOW. Thursday, May 3: Hear the Candidates!